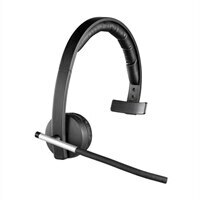 Logitech H820e Wireless Headset - MonoThe Logitech Wireless Headset H820e, available in mono and dual versions, combines enterprise-quality wireless audio with superior design elements, making it Logitech’s good wireless headset. Interruptions are minimized with a distinct in-call LED light, and muting is intuitive thanks to the on-boom mute button and LED mute indicator light. The Logitech Wireless Headset H820e, available in mono and dual versions, combines enterprise-quality wireless audio with superior design elements, making it Logitech’s good wireless headset. Interruptions are minimized with a distinct in-call LED light, and muting is intuitive thanks to the on-boom mute button and LED mute indicator light.